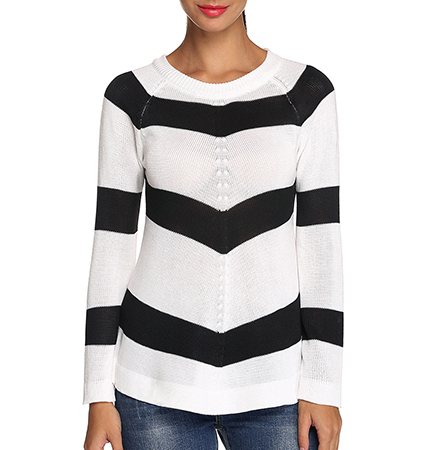 The bold black and white stripes that are printed on this women’s casual top create a modified chevron shape at the center of the garment. The stripes are wide themselves, but are also sparsely placed with wide spaces between them, adding to the overall dramatic visual impact that this top has. It features a simple, high, rounded neckline and has long, fitted sleeves. The length of this top ends just beneath the hips. It is constructed from a high quality cotton blend fabric and is machine washable. This blouse is available for purchase in sizes Small, Medium, Large and Extra Large.